VP Edward Sekandi and Indian delegation. 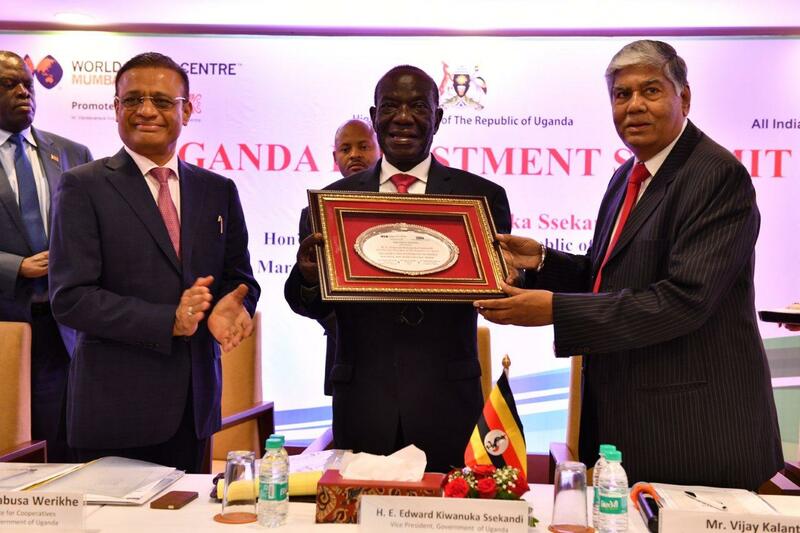 The Vice President, Edward Kiwanuka Ssekandi, currently on commercial diplomacy trip in India, has assured the Indian investors of government of Uganda commitment in providing a conducive environment for business, which he said was one of the countries top priorities. He said that Uganda is already becoming a prime investment destination in Africa due to a predictable business environment, liberalized economy, market accessibility and security for investment, first arrival privileges in tax exemptions and a stable political environment. The Vice President who was yesterday speaking at the at the first Uganda-India investment conference at the World Trade Centre in the Arabian sea coastal city of Mumbai assured Indian business executives of the government’s resolve in ensuring a stable, safe and conducive environment for business. 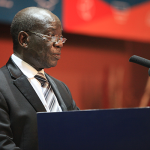 Ssekandi said that, whereas Uganda’s population has about 40 million people with a growing middle- class, investment in the county avails opportunities for access to the East African Community market of up to 140 million people and the COMESA market of 400 million people adding that with the just signed free trade area, Africa was now an area where to make money. 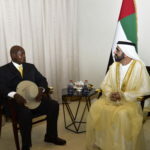 He said the conference that Uganda was now more inclined to commercial diplomacy because doing business with the rest of the world was a more logical and mutually beneficial than waiting for overseas assistance a path he said through which Uganda will generate more true fiends with whom they will trade on more balanced terms. He noted that Government was prioritizing investment, trade and tourism as important areas of focus saying Uganda now is the principle hub of business consultations, knowledge dissemination and business interaction in the great lakes region of Africa and that the Indians known for their investment resilience would find Uganda a great place to do business. Ssekandi said that the trade between India and Uganda was less than 600 million dollars saying Uganda aims at accelerating trade and investment between the two countries to generate more collaboration to double the trade in the next year and raise it to 2,000 million dollars the next three years. Speaking at the same function, Minister of State for Trade, Ministry of Trade, Industry and Co-operatives, Michael Werikhe said Uganda has a competitive advantage in agro-processing, fisheries, minerals and Uganda has also found itself in the world map for its rich crude oil reserves and refinery capacity. He also said that farmers in Uganda produce crops 3 times in a year as the country is gifted with tropical and temperate climate zones and also because 90 per ecnt of land is arable saying with investment in advanced farming technologies one can produce four times a year. Speaking about the ease of doing business in Uganda, State Minister for Agriculture, Joy Kabatsi told the Mumbai businessmen and women that investors can register a business in Uganda in 2-3 days saying that Government has launched one-stop-centre for all procedures such as work permit, environment assessment, tax compliance. Uganda High commissioner to India Grace Akello said the Conference was a landmark event in the history of India-Uganda relationship which she said dates back to 120 years and called for renew of relationship by exploring new frontiers for collaboration, especially with city of Mumbai which is India’s commercial bedrock. Exim Bank MD David Rasquinha confirmed his bank willingness to support Uganda projects saying, Uganda is a gateway to 150 million consumer market in East Africa. The economy of Uganda is growing 60 per cent faster than other African countries and urged Indians to explore opportunities in the food processing sector. He said the Government of Uganda has already seeking funding from EXIM Bank for development projects such as Uhuru Hydro Power Project US $270 million, US $141 million for electricity lines and substations project, US $ 64 million dairy project, US $ 100 million Kampala industrial and business park project, among others. All India Association of Industries, Chairman, World Trade Centre Mumbai Vijay Kalantri, called for the need to encourage SMEs to explore business in Uganda saying India has a vast and vibrant MSME sector covering a wide range of activities and that given Uganda’s rich natural resources, there was opportunity that the co-operation could be explored with great advantage. The conference also addressed by Uganda’s Honorary Consul in Mumbai Madhusudan Agrawal, was attended by over 3000 participants including consular corps, Government officials, representatives of trade and industry, financial institutions, education institutions and members and civil society. All India Association of Industries, Chairman, World Trade Centre Mumbai Vijay Kalantri, called for the need to encourage SMEs to explore business in Uganda, saying India has a vast and vibrant MSME sector covering a wide range of activities and that given Uganda’s rich natural resources, there was opportunity that the co-operation could be explored with great advantage. The two-day event co-sponsored by Ajanta Pharma, WAPCOS and Exim Bank and Uganda High Commission, also featured several business to business engagements and presentations on investment and tourism opportunities in Uganda and cultural programmes.